It is that time of year again when we catch ourselves coming and going. Remodeling cabins, cleaning cabins and getting the grounds in shape. At least this year we are doing this with no snow on the ground and no ice on the lake. Ice out was about the 17th of April. A bit early but not that far from a so called normal ice out. The lake level was very low right at ice out but it has been creeping up to a summer normal level. 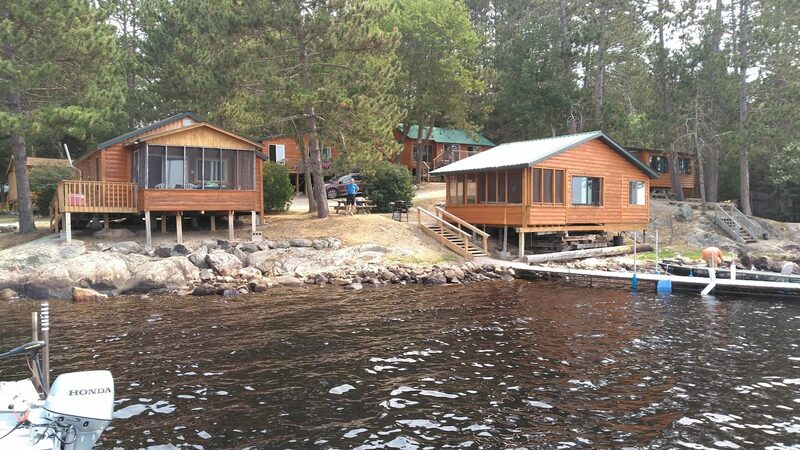 There are a couple of pictures below of the renovation to cabin #5. That will be done soon and then on to #6. There has been a lot happening around town. At least two new restaurants will be opening this spring. One is a specialty grilled cheese place in the 900 block of Sheridan St. Sounds interesting. The Insula Restaurant is open in the former Vertin’s restaurant space at the corner of Sheridan and 2nd Ave. Renovations to several building around town have been going on including the Sheridan Street theater, hope it will be open this summer. Also a folk school will be opening in the old Fisherman’s Head Quarters building in the 200 block of Sheridan St.
We look forward to our first guests arriving the 8th of May. Things are shaping up to be a pretty busy summer. We have posted many specials on our web site, so please check it out. Jack getting a drink from his favorite water dish, White Iron Lake. Fishing opener is in 8 days. Look for lots of fishing report info and pictures soon.